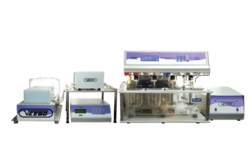 Leading Manufacturer of digital tablet dissolution test apparatus, microcontroler based dissolution test apparatus, auto-sampler unit with peristaltic pump and tablet disintegration test apparatus from Chennai. We are a leading manufacturer ofDigital Tablet Dissolution Test Apparatus. 14 Nos. Easy to attach and detach 'Press Fit' wobble free Stirrer shafts with removable Paddle / basket assembly. 14 Nos. Unbreakable clear MOULDED Dissolution Vessels or Glass Vessels. Motorized sensor tray to measure individual vessel temperature, can be programmed to move as per set time. Equipped with very reliable maintenance free stepper motor drive for stirrers. Sampling tray with 6 probes can be programmed to move as per set time. 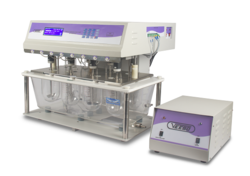 Fraction Collector Unit is completely enclosed to prevent contamination. 8 Nos. Easy to attach and detach 'Press Fit' wobble free Stirrer shafts with removable Paddle / basket assembly. 8 Nos. Unbreakable clear MOULDED Dissolution Vessels or Glass Vessels. Molded Water Bath with non-corrosive Tank plate. An external probe to indicate vessel temperature. Bank of 12 operator names with individual password. Facility to enter Company name on the test report. Memory to store 48 test records. Wake-up mode to turn on the heater on predetermined time intervals. We are a leading manufacturer ofMicrocontroller Based Dissolution Test Apparatus. 8 Nos. Easy to attach and detach 'Press Fit' wobble free Stirrer shafts with removable Paddle/basket assembly. Advanced, Eight Tests Microprocessor based instrument. Equipped with very reliable maintenance-free stepper motor drive for stirrers. This instrument is similar to model VDA - 8D with advanced features. Fraction Collector 6 X 10 vial positions. 12 Channel Peristaltic Pump for sampling and replenishing the volume. Provision for selecting the sample volume as well as the number of test samples. Automatically performs rinsing, sampling, and replenishing operations. Simple Calibration mode for sample volume. 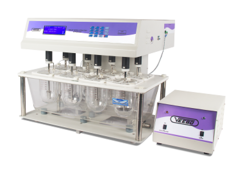 The system is supplied with Fraction Collector of 6 X 10 vial positions. Accurate positioning of dispensing arm with respect to the vial tray for zero spillage. This unit is compatible with Model: VDA - 8D (ARM). Timer maximum interval setting 4 Hours. Memory Store 95 tests method parameters. 'PARKING' facility: Enables stationary positioning of individual baskets above test media before and after test independently. This instrument is similar to model: VTD-DVP with advance features. Timer maximum interval setting: 4 Hours. 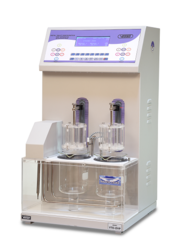 Looking for TABLET DISSOLUTION TEST APPARATUS ?